December 1890: he made his first appearance on stage, at the Shintomiza, where he received the name of Bandô Mitahachi III and performed in the drama "Higuchi no Kanemitsu Sakaro no Aranami". 21 August 1897: his father Morita Kan'ya XII died. November 1906: Bandô Mitahachi III became nadai and took the name of Morita Kan'ya XIII at the Shintomiza, performing in the dance "Renjishi". 1909: the management of the Shintomiza was taken over by the Shôchiku Company. October 1914: premiere at the Meijiza of Okamoto Kidô's drama "Soga Monogatari"; Kan'ya played the role of Soga Jûrô [casting]. 1915: Kan'ya created and led the Bungeiza, a theater study group, which focused on new productions (Shinkabuki, modern theater) and also the adaptations of Western plays. 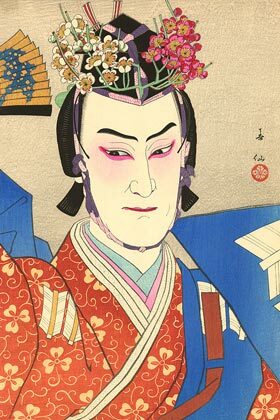 The two others main actors were Ichikawa Ennosuke II and Nakamura Tôzô V.
28 ~ 30 June 1915: first program of the Bungeiza at the Imperial Theater. Then, the group stayed inactive up to 1918. July 1922: premiere at the Imperial Theater of Tanizaki Jun'ichirô's drama "Okuni to Gohei"; Kan'ya played the role of Tomonojô [casting]. 1 September 1923 (11:58 AM): Tôkyô was destroyed by a powerful earthquake called Kantô Daijishin, which killed more than 200,000 people and destroyed the Shintomiza. February 1925: tenth and final program of the Bungeiza. June 1929: premiere at the Imperial Theater of Tsubouchi Shôyô's dance-drama "Ryôkan to Komori" [more details]; Kan'ya played the role of Ryôkan. July 1931: premiere in Tôkyô at the Tôkyô Gekijô of the play "Ippon Gatana Dohyô Iri", written by Hasegawa Shin; Kan'ya played the role of Tatsusaburô [casting]. January 1932: Kan'ya appeared on stage for the last time, at the Kabukiza, playing in the dramas "Na mo Tachibana Homare no Ishikiri" and "Kozaru Shichinosuke". Morita Kan'ya XIII was the first in this line to be an actor and not a zamoto. He was a talented tachiyaku excelling as a wagotoshi. He was endowed with a great voice and an amazing memory. He was open to new forms of theaters and spent a lot of time and energy in the creations of new dramas. in the drama "Genta Kandô"